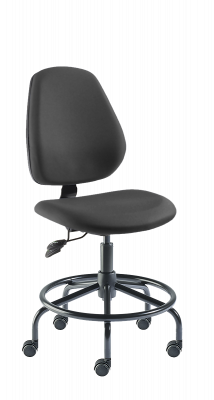 With enhanced durability, this chair is best used in clean room, static control/ESD, industrial, and laboratory environments. Tech Series with Heavy-duty (HD) Base models offer the look and performance of the award-winning MVMT family with the addition of a rugged tubular steel base, making them a leading choice for today’s industrial workplaces. Models available with tall and medium backrests. 13-year warranty. Tech Series comes standard without arms to allow tucking under work surfaces. Affxed footring, positioned 8" above ﬂoor level on HD bases for low and medium seat height models (mfg. code TUL), or 12" above ﬂoor level on HD bases for high seat height models (mfg. code TUH).